Annie’s brand is selling out to the food manufacturing giant, General Mills, who has been known to use GMO rice, corn, soy as well as high fructose corn syrup in most of their products. Annie’s boxes of kid-friendly pasta even says ‘made with organic pasta’ on the top, but that likely won’t be the case now. 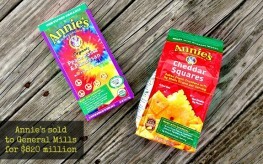 Annie’s has sold out to the GMO pusher, General Mills (GM), for a whopping $820 million. Just in case you weren’t aware, General Mills is part of the Grocery Manufacturer’s Association (GMA), the group of companies and biotech interests which have donated millions to defeat GMO labeling. GM contributed $1,135,300 (as of 2012) into anti-GMO-labeling propaganda in California all by themselves to defeat Prop 37 which would have given state residents a chance to know what was being put in their food. The company also help shoot down the GMO labeling bill in Washington. GM tried to win over non-GMO activists by taking GMOs out of their regular Cheerios (while leaving them in other versions), but this marketing act lost steam once CEO Ken Powell has proclaimed they will not be offering anymore GMO-free products in the future. They didn’t really ‘remove’ GMOs from Cheerios anyhow, since the original Cheerios in the yellow box was always made from whole grain oats. There are no GM oats. GM is clearly more interested in supporting the GMO agenda and protecting their profits than making sure healthful foods are available to the public. “But it’s not about safety. Biotech seeds, also known as genetically modified seeds, have been approved by global food safety agencies and widely used by farmers in global food crops for almost 20 years. Meanwhile, Annie’s says that their stance on GMOs won’t change, even while under the umbrella of General Mills. Annie’s has been a vocal proponent of requiring labels on foods that contain genetically modified ingredients, while General Mills fights GMO labeling efforts. Do you think such a partnership could work? I agree with John. They cannot be trusted. Annie’s off the list too. A company having a “stance” on GMO does not have to reflect what is actually in the product. And now hearing that wheat may be sprayed with Roundup right before harvest. What? My Kansas wheat farming grandfather would be shocked if he were still alive. That is not needed and doesn’t make any practical sense either. So one of the primary ingredients in lots of GenMills products, “wheat”, is now on the can’t be sure so don’t eat list. What can we do? Let the large companies plummet. We started buying Organic Flour and are now baking our own Bread. We found a Peasant Bread recipe which doesn’t need kneading. Reallly easy to make in glass pyrex dishes and tastes spectacular. We bought some organic regular loaf bread last week and ended throwing it out. Tastes strange. So we all vote with our dollars and return to a more natural life by making simple things. Well that ends my buying of Amys….another one bites the dust. You organic companies better fight off these beasts, you have more power! We ONLY WANT CLEAN FOOD. We will support you, tell us what you need ! Amy’s was my favorite go to food. NOOOO…I was wondering why we couldn’t find the Annie’s Bunny Patch snacks. Know why now. It was really the thing we liked by Annies and I hope GM leaves them alone, but I doubt they will. Anyone have a homemade gummy snack recipe? Instead of buying that “stuff” (because you can’t call it food), I’ve started baking and cooking my food myself. I can use the same amount of time doing that, cooking and baking, instead of reading labels. Labels telling me there’s “stuff” in the product that doesn’t eve remotely qualify as food! Bye, bye Annie’s. Nice knowing you. Not anymore. No good rotten traitors!!! I guess I will have to find another brand..
Ditto John Summertime. Actually i barely trusted that many of Annie’s products were something i could trust to feed my family and friends. However, I do buy their ketchup, every week, to use for various purposes and reasons, . Now that i see this sell out in print, i am going to start making my own ketchup from scratch. I would imagine that this won’t affect Annie’s or GM ‘s current marketing strategy… however, what they don’t know is the countless people i advise on what to eat and how to make it palatable. Goodbye Annie…your ketchup will be missed by many. Much as all we all miss the wonderful Naked juice when it went south. I would be very, very wary of using any product that is now part of General Mills. I am so sorry to hear that Annie sold out! Annie’s was still a processed food in a box or bag or can. Though I like their way of doing business with no GMO, I prefer to eat what I can cook at home. Amen! Processed “food” is processed “food”…with or without GMOs. That will end my purchase of Annie’s products. There is no way a monster like GM is going to stop using GMO. It will take time but the change will be made. More then likely it will be through deciet and lies on the package labels. I already don’t purchase GM products (or any of the other commercial giants garbage) but they are slowing taking over the organic market. Makes one wonder what the CEO’s were really after when they started their companies and their belief system to begin with of supplying good quality, organic healthful foods. Enjoy your riches, Mr. CEO while the world around you contiinues down the road of a slow death due to poor nutrition. Remember that when the Annies food you go to buy and feed yourself, your children or your grandchildren is nothing but garbage in the future. Sad, very sad.